I've been working in my studio today trying to sort through more of my stash. 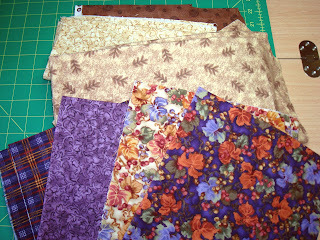 I came across these scraps of flannel from a quilt project several years ago. I thought about throwing them away, but then I thought about you! Can anyone use these? In the photo below there are 5 fat quarters. The third flanel from the top has a vest front and back cut as well as some additional fabric - I have no idea where that idea came from! 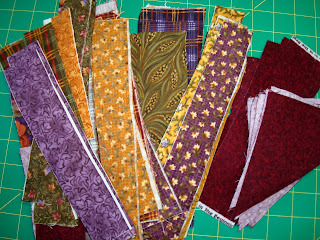 Below are scraps of various flannels. They will go to the first person to claim them. Please don't ask me to measure them specifically, after all, they're free and I'm sorry to say I just don't have the time to go into detail. This is Spring Break for me. I'll be off all week. Thursday we're headed to the Squash House with a truck full of the contents of our storage room. Why pay to store it here when it's free over there? We'll also take delivery of our new appliances over there and meet with the contractor again. We haven't had any offers on our house here as yet. People just aren't out and about yet - the weather is still pretty cold and dreary. I'm hoping when we return that house-hunting will pick up speed with more Spring-like weather. I'll try to post the last part of my Minam River Wedding before we leave on Thursday! I would love to have the flannels. I don't work in flannels but my mom does. She makes baby quilts with them. I have really enjoyed the Minam wedding story. How wonderful! Well shucks,I missed it,LOL! I have been following your wedding story too. how sweet of you to offer the flannel pieces up for grabs Candace! You have to be one of the most giving people I know! Have fun on your break and I'm believing your house will sell very quickly! That was such a sweet offer, shame I missed, I could have used them for the up-coming grandbaby. Yeah! You're home all week. That's fantastic news. What's Miss Sophie think of this treat?